Cecil went to Charterhouse (Index Pg 843), he served with the East Lancashire Reg, and was killed in action in the Middle East, remembered on panel 19 Basra Memorial Iraq. Memorial also in the Church on Ham Common. Cecil did not marry. Julius Cecil Herbert b. 26 Oct 1896 second son of Arthur Onslow solicitor S 11 University College Oxford 3rd East Lancs Regt served in Great War. Killed in action at Sanna-i-yat Mesopotamia 9 Apr 1916. 2. Lieut Cecil Herbert Julius: War Office Records, WWI. 1. Accepted into Army 23 March 1915, showing in his handwriting his ranked preference of Units to serve in. service if a man had served overseas. 3. Lieut Cecil Herbert Julius: War Office Records, WWI. To thank you for your letter of May 25 which received in hospital. Having rejoined batt I write to tell you we have had no further news of our missing offices: also that your sons kit was sent down river last month to the base and trust you will receive same in due course. We have been having a fairly lazy time of it since the end of May though the conditions are trying in the extreme - the heat being terrific. Wish I had good news for you but in the case of your son, I really think there is some slight hope unless the Arabs - of whom there certainly were a good sprinkling at Sannaiyat - found him - I feel sure we should have heard if his body had been discovered and as I told you previously he was last seen only a few yards from the enemy trench. I am directed to inform you that it is regretted that no further report has been received concerning 2nd Lt C.H. Julius, 3rd attached 6th Battalion, East Lancashire Regiment, reported Missing 9 April, 1916, although enquiry has been made in Turkey through the usual diplomatic channels. The matter has been again considered by the Army Council and they fear that in view of the lapse of time it will be necessary for them to consider whether they must not now conclude that he is dead. They do not, however, desire to take this definite action against the wishes of the relatives, and before proceeding further in the matter I am to ask you to be good enough to state your wishes concerning this, and to confirm the fact that no further news of him is reached you. I am to add that the official action taken as a result of the decision would consist in the winding up of the officers accounts, and the removal of his name from the Army list. His name would not appear again in the official casualty lists. I have to thank you for your letter of the 7th instant which has been forwarded on. I have received no news of Lt C H Julius and from enquiries which I have made from men who were also engaged in the attack on 9 April 1916 I have had to bring myself to the conclusion that he is dead - Under these circumstances and in view of the lapse of time I think it is now necessary to accept this conclusion and I am willing that the usual official action should be taken - Presumably I shall have to take out Administration of his Estate which is a small one and I shall be glad if in due course you will issue the certificate of death in such form (that?) will enable me to do so. P.S. I have left Earlswood so please address any letters to me here. Stamp: Received WO C2 Cas (Cor) 23 November 1917 Alexander House. 4. Lieut Cecil Herbert Julius: War Office Records, WWI. 1. Letter War Office 6 Dec 1917 to Arthur Onslow Julius. 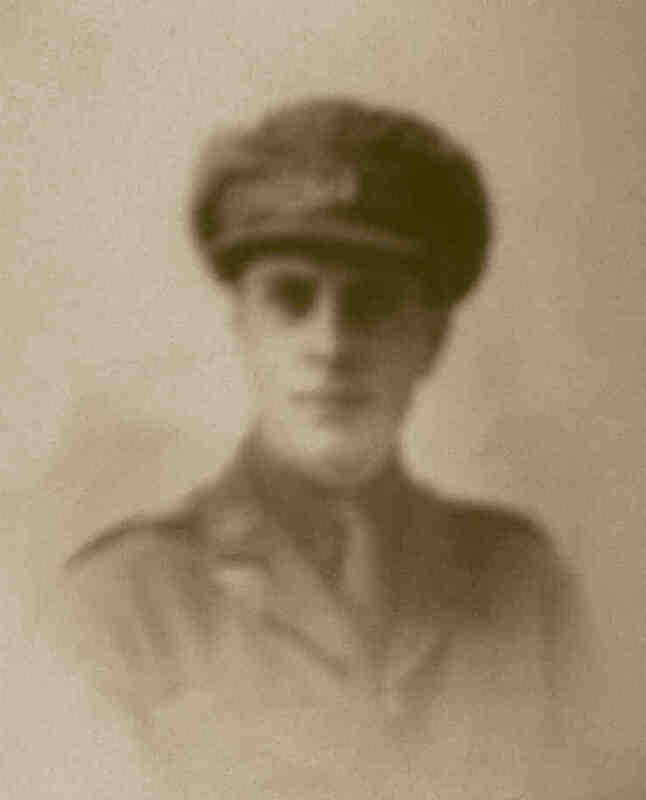 in reference to your letter of the 22nd on the subject of Lt Cecil Herbert Julius of the Lancashire Regiment, I am commanded by the Army Council to inform you that, as the latest official report regarding this officer is to the effect that he was missing in Mesopotamia on the 9th day of April 1916 this department is not in a position to and issue a . . . . certificate of death. (1) To the length of time that has elapsed since this officer was officially reported missing during period of no further information has been received concerning . . . . .
the army council I regretfully constrained to conclude for official purposes, that Lt Julius is dead and that his death occurred on, or since the 9th day of April 1916. I am to add that the Army Council have unfortunately, no doubt as to the death of this officer and to explain that their action, as set forth . . . . . Here the letter is partly defaced but appears to suggest that this letter can be used in place of a certificate of death for Probate and other purposes, it continues. I am to express the sympathy of the Army Council with you in your bereavement. Your obedient . . . . .
2. Form dated 17 May 1918 signed by Arthur Onslow Julius (Father) that Cecil did not leave a Will and Administration had not been taken out. 5. Cecil Herbert Julius: Commemoration. In these Centenary years of the Great War many articles have been produced. Three storeys high and five windows wide, Langham House has stood proudly on the south side of Ham Common since the 18th century. In both World Wars, telegrams were delivered to its residents, bringing them news of the loss of their sons on active service. So prominent a building makes it impossible to forget, when passing, the families affected by that loss. Cecil's father, Arthur Onslow Julius, a London solicitor, was the youngest son of a prominent surgeon, Frederick Gilder Julius, M.D. Born at The Wardrobe, part of the Old Palace, and his family home in Richmond, the names of Arthur's sponsors at his baptism-The Earl of Onslow, Mr Christopher, and Dowager Duchess of Shaftesbury-give some idea of the circles in which Frederick Julius mingled and also how Arthur acquired his middle name. Arthur's grandfather, George Charles Julius, M.D., had been surgeon to George IV and William IV and had received substantial gifts from both monarchs, including a magnificent pair of candlesticks which had apparently at one point been in the custody of his grandson, Arthur, perhaps even during the time he was living at Langham House. Arthur Onslow Julius married Elizabeth Woodifield, known as Bessie, a Civil Engineer's daughter, on 8 August 1888 in Kensington. (From a Chinese point of view, that could, with its string of five eights, be the most fortuitous date in the entire 19th century. One wonders whether it was a deliberate choice.) Elizabeth gave birth to their first child, Arthur Dudley, on 18 September 1889, in Richmond. Their second child, Cecil Herbert Woodifield, was born seven years later, on 26 October 1896 at Langham House, in Ham. Apart from his birth registration and baptismal record, the first official document in which Cecil appears, records him at Langham House, aged 4, in the 1901 Census in the care of three female servants, the cook. Both parents were away overnight, staying at The Residency in York's Minster Yard as guests of the Bishop of Hull, Richard Lefevre Blunt, his wife and daughters. Cecil's elder brother was in Folkestone on the day that the census was taken. He was one of the boarders recorded at The Grange, a public school for boys in Shornecliffe Road. Both Arthur and Cecil went on to Charterhouse, in Godalming, for the final years of their schooling. In March 1915 Cecil applied for a Commission as an officer, expressing a preference for the Devons, over the East Lancs and The Royal Sussexs. He was assigned to his second preference, joining the 3rd Battalion of the East Lancashire Regiment. At the time of his death he was, however, attached to the 6th Battalion. Cecil joined the unit at Port Said on 29 January 1916. Two weeks later, he embarked on the H.T. Corsican, bound for the port of Basra, where the troops disembarked on 7 March. They then had an arduous journey upriver to reach their eventual objective, the relief of Major-General Sir Charles Townshend's forces at Al-Kut (Kut-el-Amara) a city on the left bank of the Tigris River, where they had been besieged by forces under Khalil Pasha. The previous year, Townshend's forces had failed in their attempt to capture Baghdad, and in their retreat, handicapped by a large convoy of their sick and wounded, they had been forced to halt and make a stand at Kut. For three months desperate attempts had been made to break the siege, with large numbers of troops being diverted from other theatres of war to Mesopotamia (Iraq). The 13th Division had been one of the last of the expected reinforcements to arrive. The soldiers can have had no doubt what challenges awaited them, and that against an enemy that had hitherto been superior. On 21 March the battalion was moved with the rest of the 38th Infantry Brigade to Wadi Camp and five days later the Commanding Officer, the Adjutant and he Company Commanders reconnoitred the Turks' position in preparation for the attack. On 5 April the attack began, and within two hours the East Lancs had achieved their objective of taking the second line of Turkish trenches. The Battalion advanced rapidly, capturing the third line of trenches with few casualties on their side, as the Turks had withdrawn to their defences at Falahiya. That evening the Battalion captured the Turks' position at Falahiya, with some losses. Then followed a rest of 24 hours for the Battalion, while they were relieved by an Indian army unit. Then the Battalion began to move forward in order to take part in an attack on Sannaiyat scheduled for 9 April. Alas, what subsequently became clear, was that the Turks had only intended to hold their position at Falahiya, in order to buy time to strengthen their position at Sannaiyat. Unknown to the British and their allies, the Turks were well aware of the impending attack. The night of 8/9 April was bitterly cold. As their objective was only 600m distant, and any available cover was minimal, the 6th East Lancs were forced to keep low as they awaited zero hour (04:20). Whaley-Kelly records that "during the long wait, everyone became numb with cold". At zero hour, he records that the ground was covered quickly and easily for the first 500m, but that in the last 100m oblique flares, fired by the Turks, caused some confusion. This was followed by heavy machine gun and rifle fire, "followed by a storm of well-directed shells". Small parties of men did manage to reach and invade the Turkish trenches but the Turks rallied, regaining their front line "although the gallant survivors of the invading platoons held their own until their bombs gave out". There was much confusion when dawn broke, and under heavy fire all-except for a few companies that were able to dig in-fell back to their starting line. Whaley-Kelly summed up the failed attack thus: [It] was not due to lack of courage on the part of the troops engaged, but their ranks now contained a large percentage of inexperienced soldiers, and owing to the casualties in the previous assaults, all units were lacking in trained officers and junior leaders". When the units took stock, Cecil was found to be among those missing. He was just 19. He was last seen, by survivors, near the Turkish trenches, so perhaps he was one of those using up all their remaining bombs. One of the most painful aspects of a son's being 'missing in action' was that his parents had to endure a long wait before learning whether they should give up hope that their son had survived. It was 18 months before the Army Council wrote to Cecil's father that, "in view of the lapse of time" during which no further reports had reached them, and that enquiries which had been "made in Turkey through the usual diplomatic channels" had been fruitless, The Army Council thought it "necessary to consider whether they must not now conclude that he [was] dead". Two weeks later, Cecil's father replied, explaining that the delay was due to the letter having had to be forwarded to him. It emerged that he had also been busy in the months since his son was reported missing, in making "enquiries from men who were also engaged in the attack on 9th April 1916". He continued, "I have had to bring myself to the conclusion that he is dead." It was not until May 1918, just over two years later after Cecil's death, that the General HQ at Basra, forwarded to the War Office a list of the two officers in the 6th Battalion who had been missing since 9 April 1916. They were C. H. Julius and another Second Lieutenant, H.M. Brown. Cecil's parents seem to have derived some comfort from the date of their son's death. The memorial to him in St Andrew's Church points out that he died on Passion Sunday (the fifth Sunday in Lent). Cecil is also commemorated on the War Memorial at University College, Oxford. This suggests that he had matriculated at University College before enlisting, and had subsequently interrupted his studies there for the duration of the war. It is difficult to see how he could have fitted in any time at University College, between leaving Charterhouse and joining the Army. The loss of his brother, and the uncertainty as to his fate, also deeply affected Arthur, his older brother. His service records reveal that he had been articled to his father as a clerk, but in less than a month of war breaking out, he had joined the Charterhouse Rifle Corps, being swiftly promoted to Corporal, and Commissioned in January of 1915, attached to the 18/Royal Fusiliers. In November of that year, while he was serving with 11/The Essexs. a shrapnel bullet caused a serious head wound including excessive blood loss. He was hospitalised for over a month as "unfit for duty", subsequently attending several Medical Boards in January and again in March to assess his progress. At the Medical Board before which he appeared in May of that year, the comment was made that he was "doing well until heard his brother reported missing in Mesopotamia". Each Medical Board assessed him as still unfit for duty. In July he requested permission to rejoin his unit, which was refused and refused again in October. In November he was recommended as a Railway Transport Officer, once he was deemed fit for duty. That same month, he was granted an annuity because of the severity of his head wound. In 1915, before his posting abroad, Arthur had married Marie Louise Mourilyan and the following year, their first child, a daughter, was born. In 1917, shortly before the exchange of letters between the Army Council and Cecil's father, Marie gave birth to a son, whom they named Arthur Cecil Steuart. Electoral rolls and other documents reveal that in later life he went under the name Cecil Steuart. He was almost certainly named after his uncle. In following up the three children of Arthur Dudley and his wife, I was sorry to discover that on 4 December 1944, 237969 Captain A.C.S. Julius, R.A.C., B.A. (Oxon) serving in the 107th (5th Bn The King's Own Royal Regiment) Lancaster Regiment had been killed in action near Limburg, in the Netherlands. He is buried in the Mook War Cemetery, near Nijmegen. His father and mother died in 1958 and 1967 respectively, while his two sisters, Helen and Rosemary, survived into the first decade of the 20th century. Neither Cecil Steuart nor his sisters married, so there are now no known living descendants of Arthur Onslow Julius and Bessie Woodifield. I think Arthur Cecil Steuart Julius was always intended to be known as Cecil Steuart with the first name of Arthur being a nod to his father and grandfather. I do not know why the Woodifield in Cecil's names was dropped. It was two days ago, as I prepared to upload my post on Cecil, that I came across a remarkable and interesting web site with much information about the Juliuses and the many families connected with them. This research is the work of Edward Fenn and many other generous contributors, who are listed on the website's Contributors' Page. The research notes are exemplary and the extracts from family documents thrilling. I am sure it will delight those of you who are local and family historians with an interest in Richmond's past and of course.also anyone with connections to the Julius family. And for those readers interested in seeing a photo of Cecil, there is one on the site. However, it is subject to copyright, so I am, at least at present, not able to use it. Imperial War Museum, War Memorial Register, 'Julius, C.H. ', https://www.iwm.org.uk/memorials/name/167456, accessed 24/6/2018. The National Archives, WO 339/33584, 'Officers' Service Papers: 2/Lieut. Arthur Dudley Julius, The Essex Regiment'. The National Archives, WO 339/45926, 'Officers' Service Papers: Lieut. Cecil Herbert Julius, The East Lancashire Regiment'. Photograph: Langham House, taken by Matthew Rees and used here with his permission. For more of the old houses of Ham, see http://hamphotos.blogspot.com/. Whalley-Kelly, H., Ich Dien-The Prince of Wales's Volunteers, http://nlwmemorial.tripod.com/nlwmemorial/pages/pagesmisc/sannaiyatwkelly.htm, accessed 30/10/2014.